Home Cotton	Create your own bird! Tweet tweet! These cute little birdies can't wait to be taken into your home. You don't have to feed them, you don't have to clean the birdcage and they will never fly away! 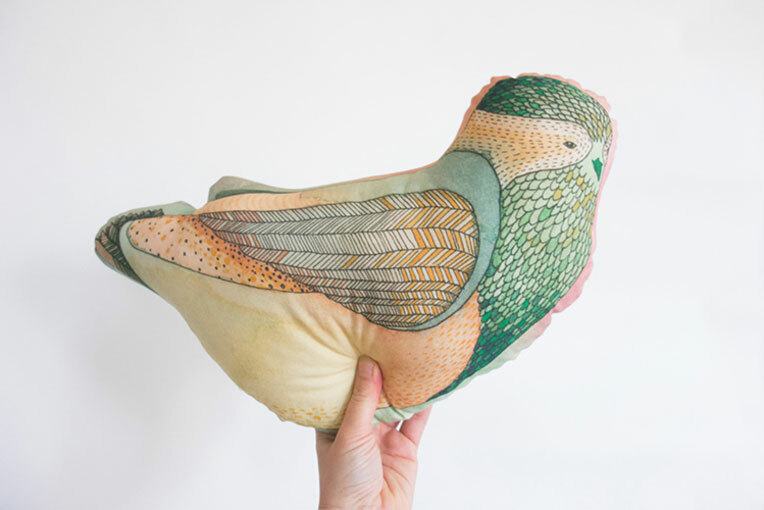 Janneke will explain in a few simple steps how you can make your own bird. Janneke, one of the Motiflow designers, came up with the idea of making these lovely cushions. "I like to draw my patterns by hand. In general, I'm a big fan of producing my own things. It’s how I was brought up, but it’s also my way of consuming less. I know from my own experience that a hand-made, or a ‘do it yourself’ piece will last longer and making it gives great satisfaction." "A few weeks ago I wanted to surprise a friend. I illustrated three colorful birds and printed them on fabric, to make cushions. The simple stuffed animal kind of cushion. When I was done, I just thought to myself: well, that's a nicely done piece! You know, one that turned out the right way. And it was so incredibly easy. It made me think of a way to share them with others. Anyone can do it and I love the idea of offering a considerably cheap but still unique product." And that is how Nicely Done started. "I want to do more of this: easy but unique DIY-projects. So I created a new account on Motiflow. It's called Nicely Done, because that is what you'll say vigorously to yourself when you see the result!" So, curious about how you make them? As I said, it's incredibly easy! Order one of the birds from my account (or all three of them, if you feel like it!). By selecting 50cm width and 1 meter length you'll receive the print and sewing directions on one single sheet of fabric. Motiflow offers two fabrics, Cotton Basic and Cotton Satin, which are perfectly suitable for this project. Cut along the dotted line. It's a piece of cake! But take your time. Place the two birds with the images facing on top of each other. Sew along the cushion with an 8mm sew allowance (which is probably the width of your presser foot). I have added some symbols to the dotted line: do not sew between them. Use the gap to turn inside out. If you want, you can now trim loose threads that stick out. Stuff the cushion. If you are looking for organic stuffing material, search for websites that offer re-filling materials from existing pillows. You can also buy a cheap pillow and rip it apart or simply visit your local haberdashery store for the right stuff. Leftover fabrics from other projects (you know, the pile we were talking about) are also very suitable to stuff with, but make sure they are cut into tiny pieces! Nearly there! The last step is to seam te gap. I used a ladder stitch, because it makes the stitching almost invisible. I refreshed my technique with this youtube tutorial. There it is. A unique pillow, handmade by you! "I will keep adding new projects and designs to this account, starting with a couple of cushions. I hope you will enjoy making them as much as I do!" Can't wait to make your own?! Order your favourite bird and sew your own... We warn you, it's hard to make a choice! Janneke makes the most beautiful patterns for her Motiflow shop, but she also prints exclusive patterns by hand on wallpaper. You can check these nice handprinted patterns on here website.